I was inspired by the title, the colours and the faces at the bottom. In April 2015 I was asked by a local community centre to lead a cardmaking class during the school holidays. The girls had fun making their cards and doing their own creative interpretation of the cards I demonstrated. This one (above) shows one of the techniques that I demonstrated on the cards "Distress Stain Splats". I added some rhinestones for a bit of bling and rubons on my layout. I did get the parent/guardians approval to post photographs. It has taken me a year to scrapbook these photos and I am glad that I waited for just the right challenge. Why not click on the link above and have a go at this challenge yourself. Great job creating a two page layout. The paint technique is a really fun one! Thanks for joining us at Scrap Our Stash! Fabulous two page layout and fun page!! What a fun layout and wonderful job with the challenge! Thank you for playing along with Scrap Our Stash! What a perfect occasion to scrap for this challenge! Glad we could inspire you. Thanks for playing along at Scrap Our Stash!! What a pretty double pager. Love it. 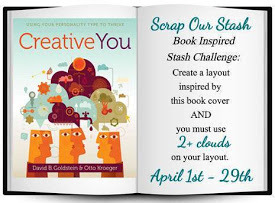 Thank you for joinng us at Scrap Our Stash. Nice double layout, great take on the challenge. Thanks for joining us at SOS.